JMG T-Shirt Model: Carl Siciliano - Joe.My.God. 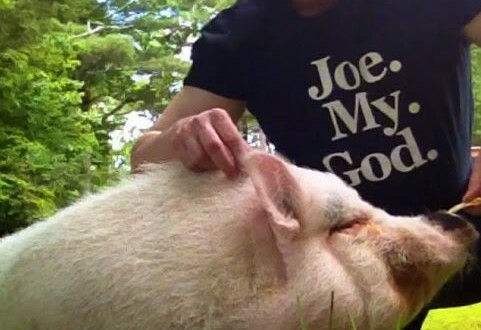 Since $5 from the sale of every JMG t-shirt goes to the Ali Forney Center, it’s only appropriate that our first model is AFC founder Carl Siciliano, seen here with his pet pig Sophie, who has her own Facebook page. Get your own shirt here – you don’t get a pet pig, but you do get a copy of the 2014 national issue of Pride Magazine. RELATED: Last Wednesday I attended the opening ceremony for AFC’s new drop-in center in Harlem, where Carl began his speech by thanking the JMG community for your amazing generosity after AFC’s main offices were destroyed by Hurricane Sandy.